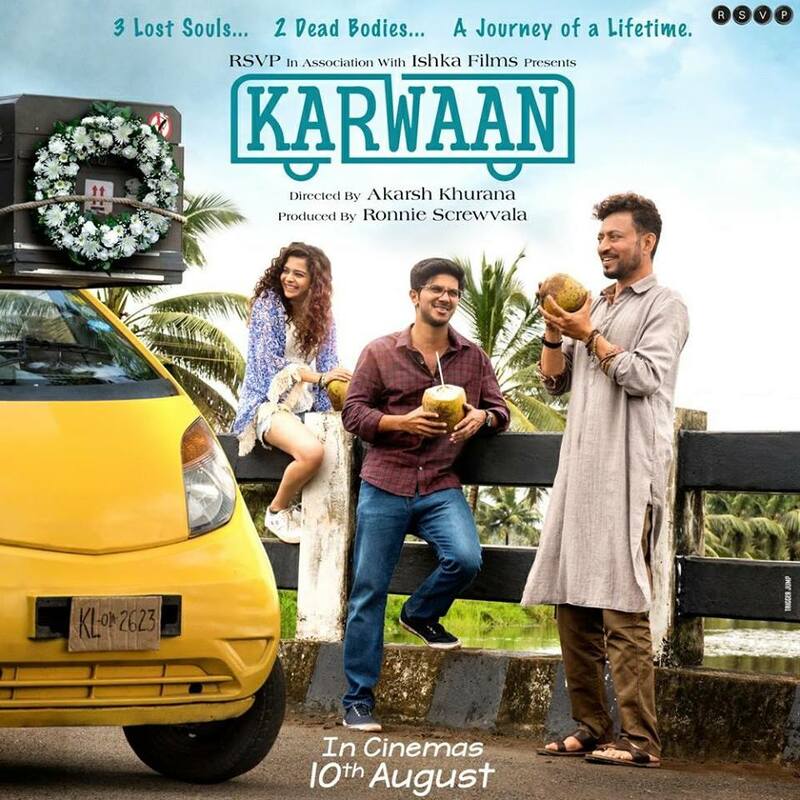 In the new film Karwaan, Dulquer Salmaan plays Avinash who has just lost his father. Joining up with his friend Shaukat (played by Irfaan Khan) he needs to go get the body and give it its last rites. Unfortunately, there is a mix-up and get Mithila Palkar into the mix as Tanya. Now we have 3 souls all trying to fix a mistake no one seems to be able to and thus end up in a journey which will in the end bring them all together. There is bound to be hilarity, there is bound to be sadness and quite likely audiences will ride the rollercoaster of emotions in between as we follow the character’s journeys as well as the trip itself. The music for the film will be brought together by Anurag Saikia and Imaad Shah. Both are new to the industry, but both are known through works in the pop sphere and some fringe movies like One Last Question. Since the music directors are new, its always best to start with an established figure. Modern day Bollywood doesn’t do many more well-established figures other than Arijit Singh. So, he is asked to lend his voice to Chota Sa Fasana. A light club beat the track allows with Arijit to smoothly run over the top of it with some simple easy lyrics. It is the the film’s main journey track and in this respect the song doesn’t disappoint. A chorus backing Arijit is a nice touch but forms the only real rhythm in the song. The beat itself is not too hard and isn’t a real dancing tune but something you could throw on in the car. The ending is a disappointment as a listener but there may be a plot point that defines the need for it better. Singer Prateek Kuhad, like the music directors, is a new name in Bollywood and he gets two songs here beginning with Saansein. A piano based rhythm that also includes a bass drum and snare used together to make a beat. Honestly, the best that can be said is that the singer was consistent. His voice is plain and lacking in any emotion or substance, which is recognised by the music directors who employ a reverb on his voice to bring it some life. However, it’s this added effect that hurts this song even more. To top it all off, the beat in parts drowns the singer out completely leaving a listener without any feel for what the song is about or for. The main song of this album is followed in two parts and is known as Heartquake. Papon brings his masterful talents here, a nice mixture of sophistication and yet reaching out to the masses. The lyrics also help with equal amounts of Urdu and English interspersed into this Hindi song. Where the singer is good, and the lyrics are also strong, the instrumentation is probably the only weakness of the song, as it certainly feels like the instruments could have played a bigger part in it all or at least provided better backup to Papon. A remix version Heartquake Aftershocks runs up at the end of the album with SlowCheeta seemingly fixing this issue and mixing in a hip-hop break to provide what could be a decent title or ending song. Still, as a remix, it was really in a better position to replace the main song if not for the light club beat that permeates it taking away from the sweetness of this song. After the first ‘Heartquake’ we need some fun, so next comes Dhaai Kilo Bakwaas. A joint effort between SlowCheeta, Anish John, Sanjeev Kumar Nair and Shwetang Shankar, it’s a song for the cowards. The ones who look at a bad guy and don’t start roaring like Sunny Deol or flexing their muscles like Salman Khan but run away. “Tu murga hai, woh don hai” is the simple point of the song. Rhythm and beat and provided by synth instruments and the occasional tabla to surprise the listener which are balanced to allow people to listen closely to the lyrics but not turning it into some form of modern qawwali. Prateek’s second song for this film is Kadam. Quite obvious from the tones this is about a character getting lost. It’s not sad, not happy, just a person broken by some circumstances. The singer is simply paired with an acoustic guitar to act as beat and rhythm to which Prateek is without fault. While the song stays constant, it also seems to be ever moving but not so far as to call it fluid. Prateek’s single toned voice is very handy here and he does seem to sing it very well. Nevertheless, its easy to lose focus in it and thus the lyrics do seem to get drowned out. Finally, this round up can end with Bhar De Hamaara Glass. Those of the right age will think instantly of non-Helen based cabaret numbers in seedy bars with the hero crying into a glass of alcohol while a sultry maiden tries to distract his attention. All that you hear when you think of a song like this are in for this with bass guitar, drums, keyboard and occasional trombone bringing briefly big band jazz back to life. The occasional flutter of the harmonium is thus very out of place in all this. The singer, Saba Asad, also seems to have an echo applied to her voice and at these points she seems to disappear. This may have a deliberate need within the film but as a song it does make it hard to enjoy it. Often simple films that do well have brilliant twists acted by superb actors who don’t give the game away at all until its all too late as a cinemagoer. Karwaan too looks like it will be able to do this even though its music while having its merits does seem to not help in this job. Most of the singers do an admirable if not excellent job, the music while generally lacking rhythm certainly has some fun beats. Some of the beats however are also a bit too formulaic and repetitive to be given credit. There is a great variance in the quality and rating of individual songs, leaving no choice but to give the album overall a mediocre mark.